Hello Everyone! Welcome to another weekly pre-airdrop news for PRiVCY Coin. This week we will talk about Airdrop round #9. In less than 30 hours we will witness another airdrop round for PRiVCY Coin. In less that 4 hours the registration will close and everyone should make sure they complete all the requirements for this week and follow all the rules for this round. Don’t forget that this week a mandatory re-tweet for FATBTC listing is strictly obeserve and make sure you complete this task to qualify for the airdrop. 80% HODL rule is enforce this round and all balance will be check in 4 hours from now. Make sure your PRiVCY coin are in your airdrop address. Once everything has been check no re-check will be made and you will end up missing the airdrop. The official Webwallet of PRiVCY Coin has been updated to a new version and you can now export your private keys and import them on your desktop wallet. This development update for Webwallet is just the start and soon more features will be added on the official webwallet. Coinmarketcap page of PRiVCY has been updated and now you will see Crex24 in the available market for PRiVCY Coin. As of now, BiteBTC and Crex24 are exchanges that provides volume report for PRiVCY Coin. As we are getting closer for Airdrop 11 make sure you are ready for the requirements of 5,000 PRiVCY Coin holding requirements to qualify for the 95% Airdrop. 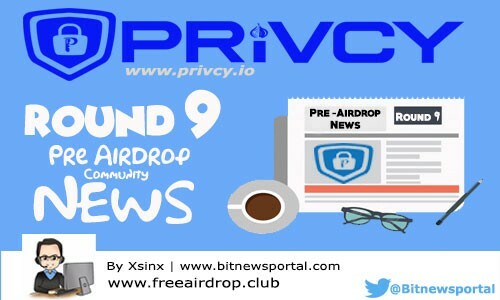 That’s all for today, see you again tomorrow after the airdrop, for the Round 9 Post-Airdrop Community News.